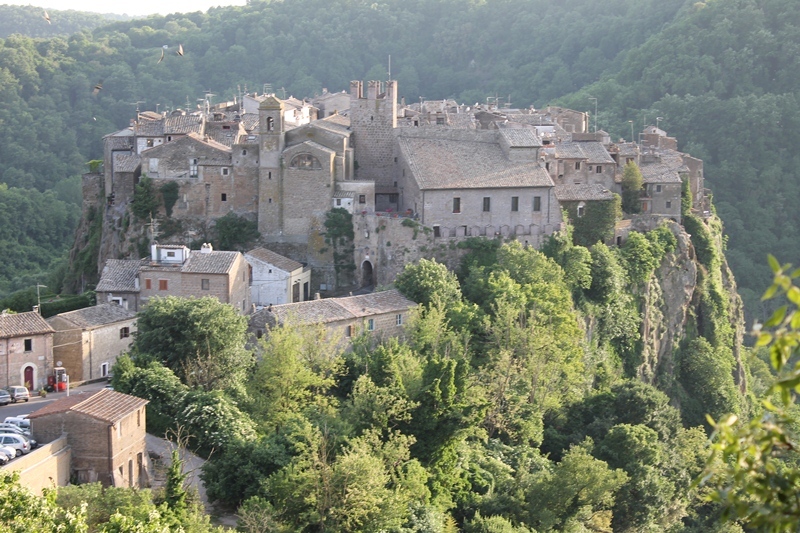 The ancient town of Calcata sprawls over the top of a circular tuff spur looming on the background of the Treja Valley. Via degli Americani is the main access route to Calcata, and it leads to Piazza Roma. Surmounted by the Anguillara’s coat-of-arms, the ancient gate is locally known as Bocchetta, and it was formerly closed by a drawbridge, of which the town entrance still preserves the holes where the chains ran. The S-shaped pedestrian entry is carved in tuff and partially fortified by mighty walls. Piazza Umberto I features the Church of the Most Holy Name of Jesus, Palazzo Anguillara, and the medieval tower. Piazza San Giovanni houses the Museum of Peasant Culture, situated in the Church of St. John. The so-called Granarone is another important cultural hub in town. The external town walls are peppered with sightseeing points over an ever-changing and evocative landscape. Not far from the town gate, passing through the 20th-century district and Via della Fontana Nuova you’ll reach the Fontanile, which leans against the monumental urban fountain, and the Antico Lavatoio (the ancient washtub). From Piazza Roma, take Via degli Americani and then Via Cadorna. From here you can get to the district named I Grotti, where you can visit the church of the Madonna della Cava. Continuing onto Via della Lira, you’ll reach Calcata Nuova and stumble across the beautiful outdoor theatre placed inside a public garden. Piazza Risorgimento hosts the Town Hall, the Church of St. Cornelius and St. Cyprian realized by architect Paolo Portoghesi, and the municipal theatre.